I just secured a test pressing of a version of this record. I say a "version", because the track listing is different. Side A has a version of 'Down In The Streets' that's quite different than either on side B, it's then followed by the vocal version of 'Let's Go Down'. Side B has 2 version of 'Down In The Streets', but neither is an instrumental. Neat to have a little piece of Oakland and West Coast Hip Hop history. As ryanmd points out, 75 Girls is indeed etched into the runout on both sides. 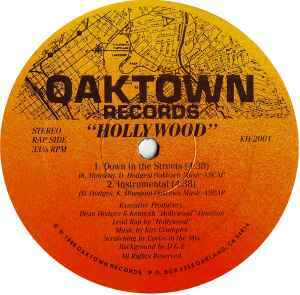 The rap track "Down In The Streets" is a very cool track on this 12"!! Haven't seen this for sale ever exept once on Ebay (high price). So it could be scarce...or simply unknown! I hope some find their way to the "market" cause I REALLY would like a copy!! !